Recently my family took a trip to Southern California. While we currently live in the Detroit area of Michigan, I was born and raised in Southern California, and half of my family still lives there. With my two young children, we make it a point to travel as a family to visit the area at least once every couple years. This time though, it was different. We didn't really feel like we were traveling with babies any more, since my youngest is three years old, and my oldest is five. We didn't have to schedule anything around naps, or breastfeeding breaks, or diaper changes, and that (in and of itself) was amazing. 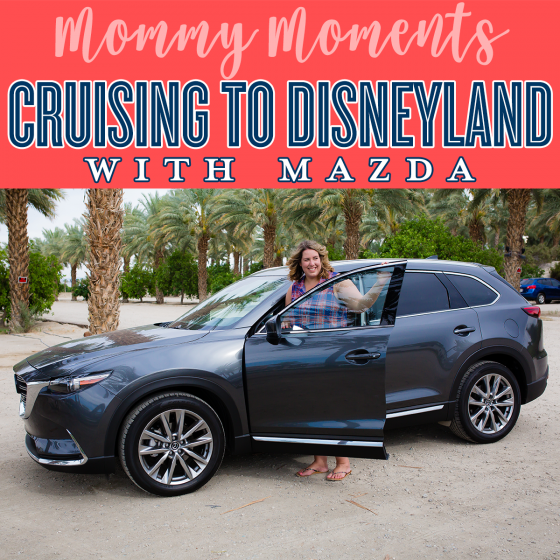 We did, however, get the opportunity to test drive a Mazda CX-9 for the week, as well as visit Disneyland with the children, and I'm here to tell you all about that experience today. 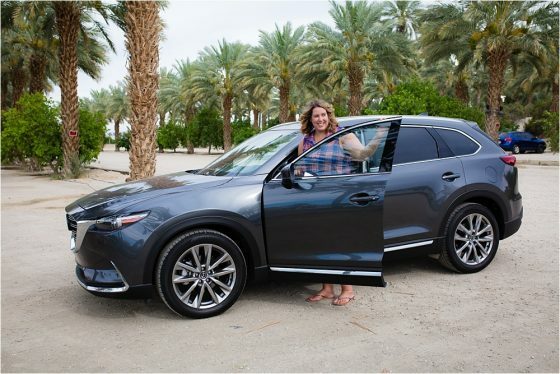 We got the chance to use the brand new and swanky 2017 Mazda CX-9 for the duration of our visit. Saying goodbye to this SUV at the end of our visit proved almost as difficult as saying goodbye to my actual family. In fact, my children still talk about our "borrow car" that we had for our visit. We picked up the car in Los Angeles, and spent the entire week test driving it to various locations throughout Southern California. Immediately, we drove from LA to Palm Springs, where my family all lives. I loved the luxury features that the car offered that helped me navigate easily through the busy Los Angeles traffic, such as the back up camera, blind-spot alarms that sound if you have a car in your blind area and flip on your blinker to change lanes, and also the in-dash standard navigation system that told me where to go, and even which lane to be in in order to find my exit or correct highway exchange. 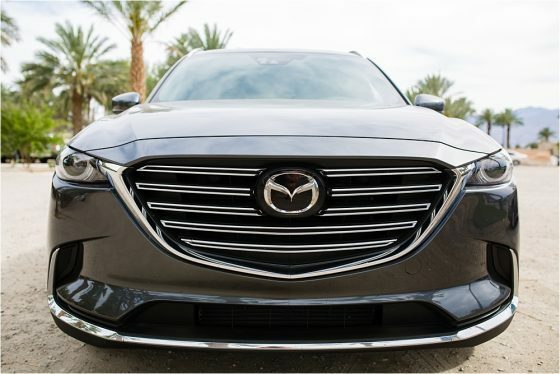 The CX-9 is unbelievably comfortable and roomy, and features some amazing features that made us feel like we were behind the wheel of a luxury vehicle, such as the in-dash, touch screen that can do everything from navigate to play your favorite Sirius radio station. (Mine happens to be the 90s on 9 channel.) Some other additional features that we loved as a family were the built-in sun shades on the backseat windows, the easy-to-use moon roof, and the three different climate zones, that was perfect for setting each person's ideal temperature while in the hot California desert. It was also smack dab in the middle of allergy season, and the pollen filter also proved very helpful for all of us. 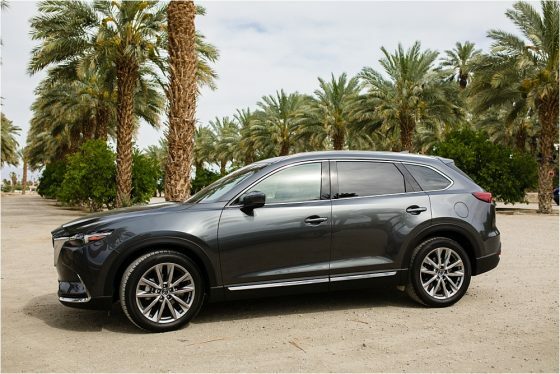 You can't go wrong with an SUV when on vacation, and the Mazda CX-9 gives you the features that you will love along with the added safety you know you can trust. If you're anything like me, you will love it so much you'll want to trade in your regular car for your "vacation vehicle." Tip: We used car seats from Evenflo for this trip. Since they were new, we kept them in their packaged box, and checked them along with our luggage on our Frontier Airlines flight. Since they were packaged from the manufacturer, we didn't have to worry about them being jostled or handled roughly. Installing them into the Mazda CX-9 once we arrived in Los Angeles was easy and quick. To return home to Detroit, Frontier Airlines provided us with two large, sturdy plastic bags to place the car seats in when we checked them. 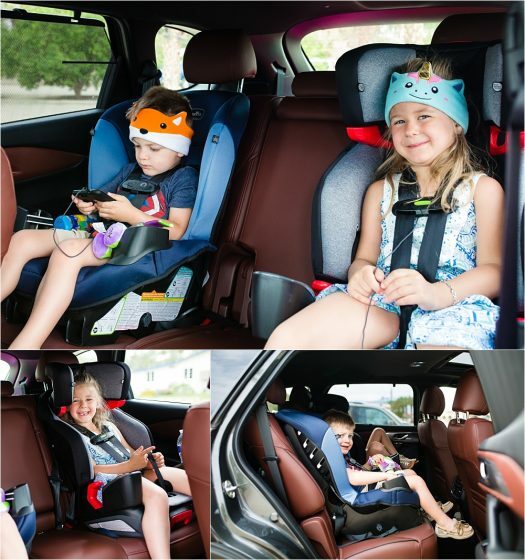 To learn more about the awesome Evenflo car seats, check out this #TravelHacks post. Most of the tips in the post are tried and true, and were put to the test on this family vacation. This one may go without saying, but if you're in the Southern California area, hitting up Disneyland is an absolute must. We spent the day exploring the park with the kids, and it was an amazing experience. Let me start off by saying that if you're on the fence about taking a child to Disneyland because of a specific reason, they will probably flip the coin and totally surprise you. My three year old has little-to-no patience. I literally had pre-Disneyland nightmares about being stuck in a line for a ride, and having to control a temper tantrum prone toddler. I can say now that he did absolutely amazing in the park. We did "stack the deck" in our favor to begin with, because we scheduled our visit for a Wednesday that we knew wasn't during most school's break time. It was about two weeks after Easter, and therefore wasn't a popular spring break destination. 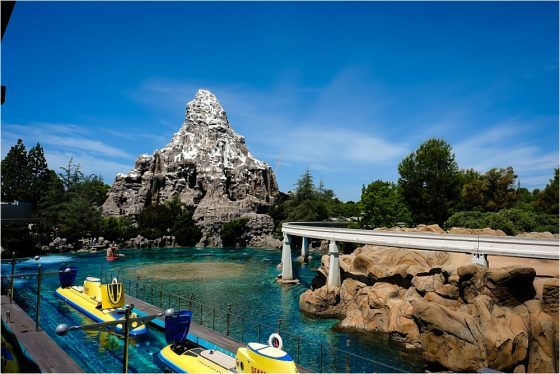 We also decided that since we only had one day to visit the park, we were not going to purchase park hopper tickets, and we would focus solely on experiencing the Disneyland park, and leave the California Adventure Park for a vacation where we could spend more time in the Anaheim area. We immediately utilized the Disneyland Mobile App on our phones. With the app, we were able to see a map of the parks and see each ride's wait time, without walking over there. We could also locate each character's location on the map. I'd like to kiss the inventor of the Fast-Pass on the lips, because we were able to schedule riding the more popular rides around picking up fast passes, and the longest we waited in line for a ride with one was 15 minutes. 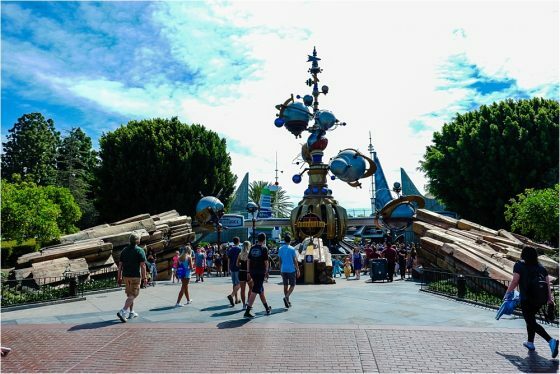 Even without the Fast-Pass being available for every single attraction, the wait times weren't ever outrageous, and wrangling impatient and excited kids in line wasn't anything close to the nightmare that I had dreamed up. 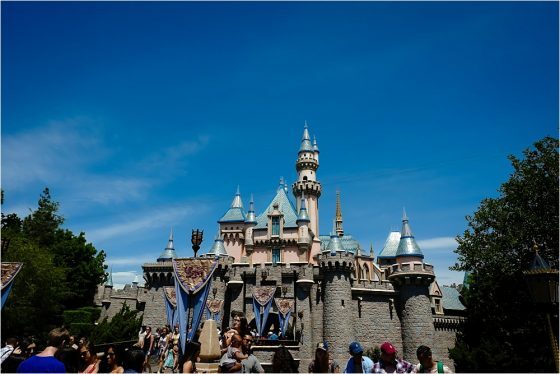 Tip: Did you know that you're able to bring packed food and drinks in with you to Disneyland? I packed lots of snacks that fit nicely into a backpack that kept the food cost down throughout our visit. We snacked all day on small bags of trail mix, granola bars, and bananas. We purchased a souvenir cup early in the day, and were able to get cheap refills of cold iced tea or lemonade throughout the day. Since we arrived when the park opened at 10am, and had already stopped for breakfast on the drive up, we snacked all day on the items I packed, and had one meal inside the park. While you may be tempted to grab a quick corn dog on the way, we actually decided that having a sit-down and nutritionally balanced meal was important to us, and something that we were okay with spending the money on. After a long, hot afternoon in the sun, the air conditioning inside the restaurant was lovely. We used the app to make a dinner reservation, and by the time we reached the restaurant, we didn't have to wait at all. Another perk of a sit down restaurant was not having to pay for drink refills. It also honestly provided us an enjoyable time to rest and rejuvenate ourselves, before we finished up the busy day and stayed for the Main Street Electric Parade. Having tall children, the whole family was able to ride every single ride that day, with the exception of Space Mountain. (You have to be 44" tall for that, and my son is only 41"). My 5-year old daughter's absolute favorite ride of the day was The Big Thunder Mountain Railroad ride. My son's favorite ride was the Haunted Mansion. We located most of the characters that the kids wanted to see using the app, and also saw all of the photos taken by the professional Disneyland photographers on the app using a code given to you by the photographers. 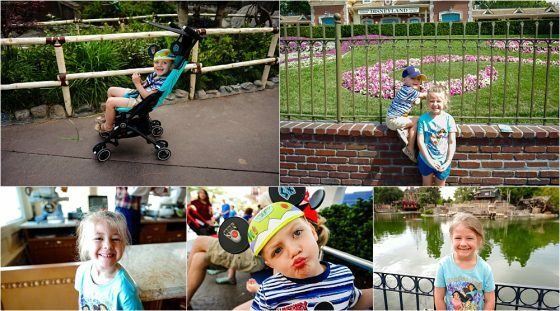 Those are a fun memory to purchase, and the photos from the Disneyland photographers are a higher resolution than your cell phone, so they are able to be printed in enlarged sizes nicer. We ended the day by staying for the parade, and the kids were thrilled to see their favorite characters have a part in the Electric Parade. 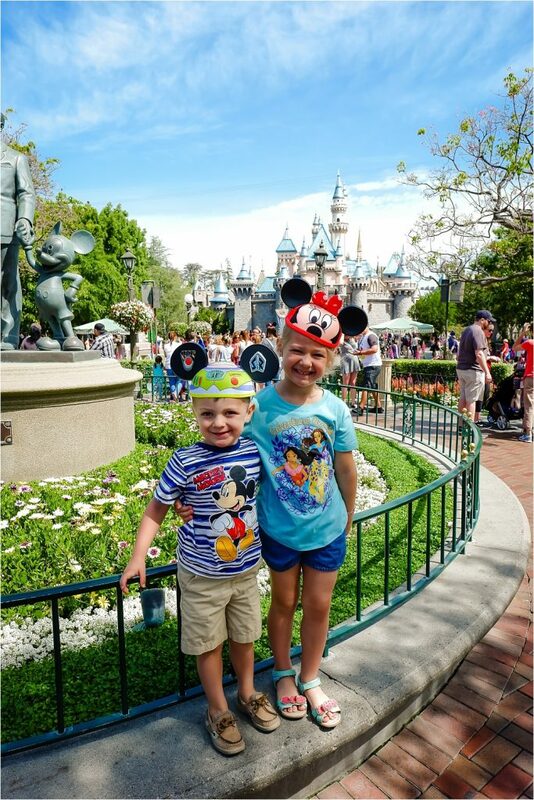 Our vacation cruising around Southern California and visiting Disneyland is one that my kids will remember for a long time. A month later, my daughter still says, "Going to Disneyland was the best day of my life." I know that making these memories and spending time as a family is important, and urge you to take a fun family vacation and share your special memories and photos with us on our Facebook page. Make sure that you stay tuned to our TRAVEL section to see other amazing and family friendly destinations that we are sure you will all love. Also, check out our Instagram to see other photos from our awesome #DriveMazda experience.